The subseries contains source material on the activities and communications of the Corporation de la gestion du Chemin des Cantons. It consists of press clippings from 2006 to 2012. The subseries contains primary source material on the communications of the Corporation de la gestion du Chemin des Cantons. It consists of press releases, a press conference and media strategies for the Chemin des Cantons from 2009-2012. The subseries contains primary source material on the Corporation de la gestion du Chemin des Cantons' contributors. It consists of correspondence, partnership proposals, and contracts from 2006 to 2012. The subseries contains primary source material regarding the finances of the Corporation de la gestion du Chemin de Cantons. It consists of financial reports from 2007 to 2010. The subseries contains primary source material on the budgeting and accounting of the Corporation de la gestion du Chemin des Cantons. It consists of budgets, financial summaries and expense reports dating from 2007 to 2011. The subseries contains primary source material on the activities and administration of the Corporation de la gestion du Chemin des Cantons. It contains correspondence from 2006 to 2011. The subseries contains primary source material on the administration and activities of the Corporation de la gestion du Chemin des Cantons. It consists of meeting agendas, reports, lists of attendees, notes, programmes, presentations and surveys. The subseries contains primary source on the activities and administration of the Corporation de la gestion du Chemin des Cantons. It consists of workplans and workplan summaries from 2008 to 2012. The subseries contains primary source material on the activities and administration of the Corporation de la gestion du Chemin des Cantons. It contains reports and questionnaires from 2007 to 2011. The subseries contains primary source material on the activities and administration of the Corporation de la gestion du Chemin des Cantons. It consists of extracts of minutes, meeting agendas, correspondence and reports from 2008 to 2011. 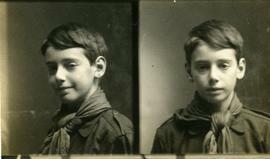 Item consists of a photograph of the 2nd Sherbrooke Troop Boy Scouts camping at Lake Massawippi in1921, including a few of tents and the lake. 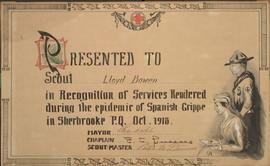 Item consists of a photograph of Chief Scout Lloyd Baden-Powell at a Boy Scout rally in Montreal in 1918.